Faraway Press: The Online Home of John Jackson Miller: Vindication, Sword of the Empire (for free!) and more! Vindication, Sword of the Empire (for free!) and more! • First, at some point in the last few weeks, Star Wars: Knights of the Old Republic Vol. 6: Vindication came out, both at your local comics shop and at Amazon. I have posted a few notes on the liner-notes page here on site, although there were no corrections made to the volume that I can remember. This is the largest volume to date, collecting seven issues — and, as I reflect on it, probably one of the strongest, when it comes to accomplishing what we were trying to do. The story covers an enormous amount of territory — and "Exalted" is one of my favorite stories of the series. It's just fun. Remember, Volume 5 is actually Vector Vol. 1. You won't necessarily find it on the shelf with the KOTOR volumes, but it should be there. • Next: The role-playing adventure I wrote for the Dawn of Defiance Campaign is now online: Sword of the Empire. You can find the download for the e-book at the Wizards of the Coast site. The adventure, for high-level characters of the Star Wars Role-Playing Game, is based on Rodney Thompson's initial campaign concept, but I got to embellish it with some fun encounters, including — and this is of note for your KOTOR fans — a huge amount of background material on the Stereb, the race from Serroco in "Days of Hate." Gamers playing the campaign should, of course, avoid reading this material until their GM runs the module. For others looking to see what these modules are like, or interested in the canonical material therein, it's fun reading — and it's free! I don't have notes online yet for this release — one in which I was greatly aided by The Intrepid Meredith and James Mishler — but I will try to have something online more quickly than I got to the KOTOR Campaign Guide notes! • Friend, retailer, and occasional CBG columnist Michael Tierney has released the 25th Anniversary Edition of his Wild Stars graphic novel, for which I provided a foreword about science fiction comics. Check the site to find out more, and see some free previews. 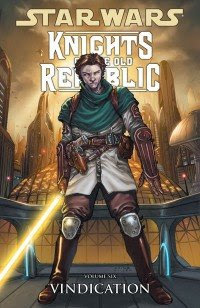 • Next, there's a page online here for Knights of the Old Republic #44, the second part of "The Reaping." This is another issue with a cool cover by Benjamin Carré, and is due out in August. Lost Tribe of the Sith: Read it for free!